Rochester Institute of Technology was the first school in the nation to grant an undergraduate degree in software engineering, way back in 1996. The model curriculum has since been used by other schools. The undergraduate program at RIT is still the largest in the nation – in fact, it has more than twice the number of students as the next highest contender. That’s a lot of cumulative knowledge to draw from! What else is it that RIT has built a reputation on? 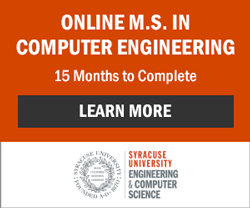 Undergraduate software engineering students at the B. Thomas Golisano College of Computing and Information Sciences take a three course domain application sequence. This is not in itself unique; ABET-accredited schools all incorporate domain-specific work into the curriculum. Some of the opportunities, though, are unique. RIT students can choose from options like bioinformatics, public policy, artificial intelligence, or imaging and publishing technology. Students sometimes propose their own sequence. The chair estimates that of the 12-15 domain sequence options currently listed, 1/3 originated as student proposals. In 1996 RIT became the first school to award an undergraduate degree in Software Engineering. The object of the domain sequence at RIT is not to gain more technical know-how, but to get an understanding of the domain where the software is applied. Whatever sequence a student selects, they are allowed to take a maximum of one course from the computer department; the other two must come from other colleges. The chair offers the following illustration: Students who opt for interactive media typically take game design or graphics. They also take a storytelling class and an animation class. The rationale? A good game is grounded in story – and who can teach storytelling best? Those who live and teach it. Chances are good, moreover, that a game designer isn’t going to do all the animation on their own. By taking a class in animation through the arts and sciences college, students can rub elbows with animators and learn the vocabulary of the industry. During their time at RIT, students typically gain a broader appreciation of software engineering and its applications. Many students enter college interested in game development, the chair reports. In fact, some have listed software engineering as a second choice behind the all too popular interactive games and media major. By senior year, these students are often enthused about some other domain where software engineering is applied, be it nonprofits, government agencies, or Wall Street. What else does RIT do to prepare future software engineers for professional success? The university is well-known for its co-op program. *Co-op gives students the opportunity to experience full-time paid employment in their field as early as the beginning of their junior year. Software engineering students are expected to complete four blocks of co-op. They begin after their sophomore year. They prepare well in advance, learning resume and job search skills. There are many options. Some students find positions in Rochester and continue to live in student housing during their co-op terms; others spend some time in a new city. Co-op allows students to experience a typical day on the job, develop technical and people skills, and make professional contacts that will be helpful down the road. Senior year, students have another real-world opportunity: the senior project. This is not unique to RIT – students in ABET-accredited programs always have significant opportunity to apply their learning. Students at RIT have excellent opportunities. Most projects are sponsored by outside agencies – nonprofits and corporate leaders alike. There have been some impressive sponsors: Eastman Kodak, JPMorgan, Goodrich. It’s a testament to RIT’s respect within the community that there are more proposals from the community than there are student teams to carry them out. Teamwork is emphasized in the undergraduate experience, the chair notes. Students who return for a master’s will have more individual study opportunities. RIT will soon have a combined bachelor’s/ master’s program. The bachelor’s program will culminate in the senior project – and then it’s on to the master’s thesis. The combined bachelor’s/ master’s program will take six years, but a significant block of time is spent out in the workplace – and drawing at least a small salary. According to the RIT website, software engineering co-op salaries range from about $8.00 to $38.46. The average is $18.15. Princeton Review ranks RIT career services as one of the top twenty in the nation. The chair reports that even during the darkest parts of the depression, more than 90% of students saw job offers. Top students often know where they will be working the fall before they graduate. The Rochester area is, of course, known for medical innovation. Biomedical engineering is a huge sector for software engineers. Many graduates find employment with the University of Rochester. Graduates have also been employed by a variety of corporations, among them, Amazon Services, Apple, Google, Oracle, and Xerox. Most software engineering graduates enter the field earning between $42,000 and $100,000. The median entry-level salary is $64,476. Considering applying to RIT? One thing that's different about the process is that students apply to a specific academic program. They're actually encouraged to apply to more than one, as requirements vary (and programs like game design are currently seeing more qualified applicants than there are spaces). The department considers SAT scores and multiple indicators of high school performance. They will consider the rigor of coursework as well as the GPA and class ranking. Students have to have algebra, geometry, and trigonometry on their transcripts; pre-calculus is also recommended. The middle SAT range for students who are accepted into the software engineering program is 1670 to 1980. Students can also expect to write an essay as part of the admission process.